If you're here it is because you've wondered how the climate of Colombia works. Maybe you're going to visit us, and while packing your bags you realize you have no idea what to pack. Winter or summer clothes? Something for the spring or for a windy autumn? The first thing you have to know is that Colombia is located in the equatorial region of the Earth; therefore, we do not have seasons! And after that, our country is crossed by the Andeans Chain of mountains that give us a lot of different climates depending on the altitude over the sea level. In Colombia, you can be in one region feeling a cold weather and at the same time someone else can be in another region feeling hot and sweaty. So please look carefully at the information we have about some main cities down this page. I didn't realize how difficult it is to show the difference in temperature and weather through the pictures, until I have to look for some to ilustrate this page. Snow covered peak at Cocuy National Natural Park, in Boyacá department. Can be sunny but freezing due to the high altitude. 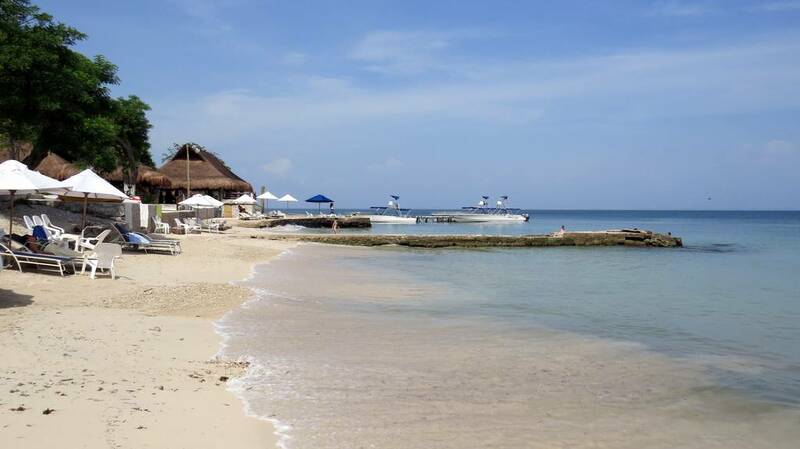 Hot and breeze day at Islas del Rosario, close to Cartagena, Bolívar department. Hot and humid day in Melgar, Cundinamarca department. 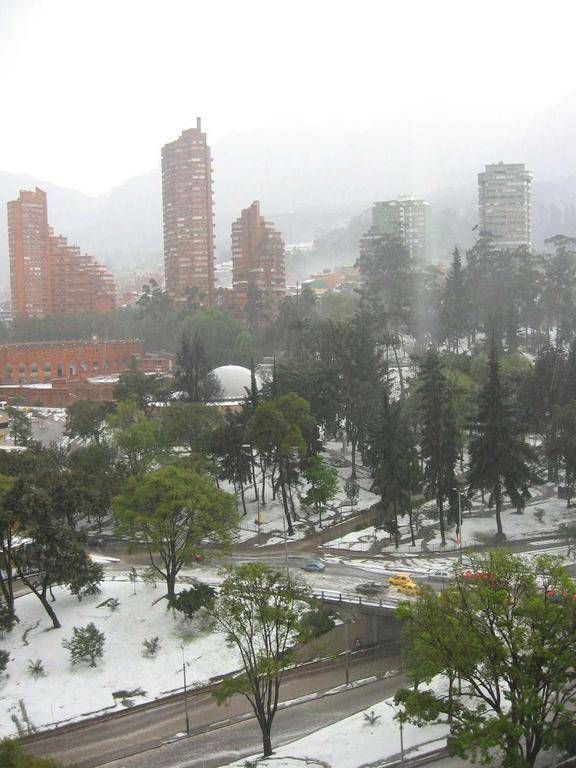 Bogotá after a hailstorm, doesn't happen often but can happen. If you were preparing your winter gear or your flannel and shorts, forget about it! The weather in Colombia is not very predictable as in some countries. However, a year has two clearly identifiable times: rainy and dry. Despite its proximity to the Equator, Colombia does not have a uniform warm climate throughout the year, as there are many geographical and atmospheric factors that influence the range of climates of the country. The main determinant geographical factor is altitude. Thanks to its impressive mountain chain, crowned by the Andes Cordillera, Colombia has almost all climates of the Earth. A Swiss friend of mine once said that in Bogotá there is a sort of permanent spring. I agree with him and I would like to add a very important fact: if you travel about two hours by car you will find a completely different climate; if you go up temperature drops and if you go down temperature rises. 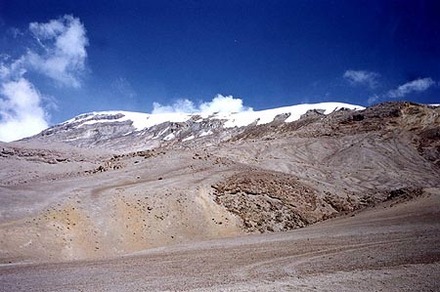 It is estimated that the temperature decreases 6°C for each 1,000 meters of altitude increase. Now imagine that in the Atlantic and the Pacific Coasts there is a permanent summer, with rain in the rainy time and dry in the dry time. It's that easy. When I was a child, I remember asking my dad, how this could happen, because if you go higher on the mountain you are getting closer to the sun, and of course I thought you will feel the heat, but it happens exactly the contrary, temperature drops. So, I think better you come and experience it by yourself. 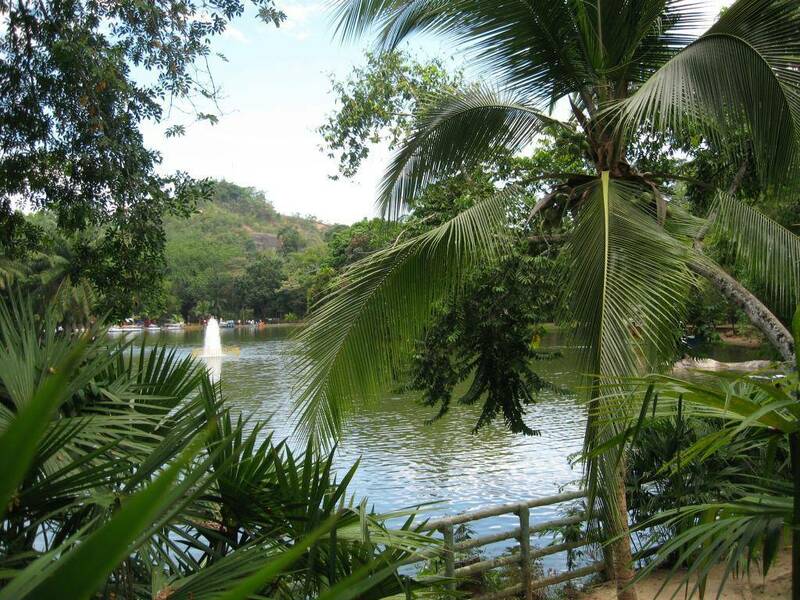 Tropical rainforest: Warm (above 27°C), rainy and humid climate. It is characteristic of the Amazon, certain areas of the department of Chocó, the Pacific Coast and part of the department of Magdalena. Tropical Savanna: This is the typical climate of the Eastern Plains and Caribbean coasts. The tropical savanna has rainy and dry times (6 months each) and an average temperature above 24°C. Tropical Steppe: This climate has little rainfall, and it is typical of the Eastern Plains and savannahs of Bolivar and the northern Guajira. Desert: With temperatures over 29°C, this climate is typical of the high Guajira. This is the less rainy region of Colombia. Mountain: This is the characteristic climate of the Andean region and areas such as the Sierra Nevada de Santa Marta. There the height determines the climate and causes the effect known as Pisos Térmicos. It is important that you consider, where in Colombia you are going to stay, before packing your bags and especially, your clothes and accessories (remember that the climate of Colombia is different in every region). Note that the dry time is from December to March and from July to August, but that could change if you're in the Andean region of the country, where there are Pisos Térmicos or Thermal floors. If you do not know exactly what places are you going to visit, we advise you to come prepared for a wonderful variety of climates and places. Anyway our climate is always mild, that's how the tropics work and we love it! Hope you enjoy the wonderful climate of Colombia! To understand climate only think about the place altitude of the place in the picture. Wonderful pics of different regions in our country.